interview“5 Questions with Youth Shorts winner Morgana McKenzie” (Kingston Canadian Film Festival) – an interview with Morgana regarding her February 2016 win at the festival. interview“Q&A w/ Teen Filmmakers Morgana McKenzie and Carol Nguyen” (She Does the City) – an interview with Morgana and Carol after their recent wins at the Toronto International Film Festival Next Wave Jump Cuts event. interview“Young Filmmaker Interview: Morgana McKenzie” (Big Little Filmmaker) – a very extensive interview by award winning filmmaker Kira Bursky. review “Future of Film Showcase 2016 Review: Ellie” (The Toronto Film Scene) – a very favourable review of Ellie. review“April 2016 Viewing Diary | The Sheila Variations” (Sheila O’Malley) – A blog post that includes a micro-review of “We All Go the Same” from the Albuquerque Film & Music Experience Festival. 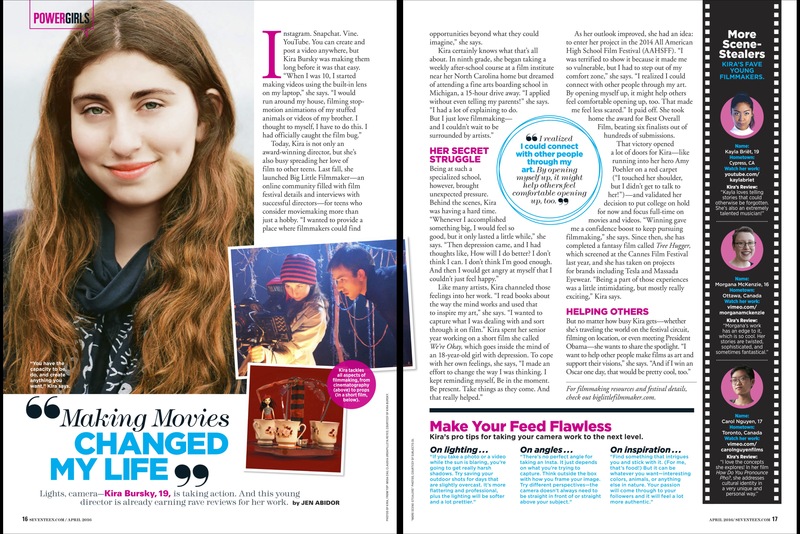 pressSeventeen Magazine, April 2016 – A profile on filmmaker Kira Bursky that includes a sidebar on several other young female filmmakers, including Morgana. press“Film festival raises money for cancer research” – Algonquin Times article on the “Lights! Camera! Cure!” event where We All Go the Same screened. press“Tyler Film Festival celebrates short films, young directors” – article on the Downtown Tyler Film Festival where both Kurayami no Wa and We All Go the Same screened. press“Local film festival showcases Ottawa’s indie horrors” – article in “The Fulcrum” (University of Ottawa newspaper). A review of the Ottawa Spookshow vent where Kurayami no Wa screened. press“First Women in Screen Based Media Event a success” by Emily Ramsay. A recap of the event, which included We All Go the Same. press“Ottawa Independent Video Award Winners” by Pat Mullen, regarding the Best Director Under 25 award for We All Go the Same. GIFTS – April 14 2014 – Radio interview with Hallie Cotnam on CBC Ottawa Morning. We All Go the Same – December 2014 – “Morgana’s Story“, a five page article, with behind-the-scenes production photos, about Morgana and her We All Go the Same short-film production. 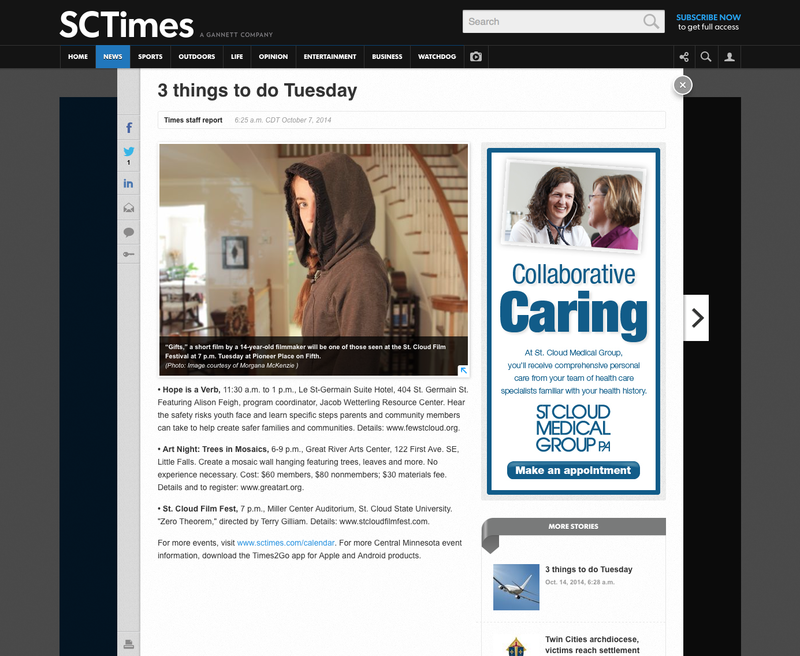 GIFTS – October 7 2014 – “3 Things to do Tuesday” (cached version), SC Times (St. Cloud) article referencing St. Cloud Film Festival. The article prominently features a film still from GIFTS. GIFTS – September 15 2014 – “Stills life: Images from new festival Fling!” (cached version), BBC News Scotland article on the new Fling! film festival. The article prominently features a film still from GIFTS. GIFTS – A private screening of GIFTS was held for family and friends at the Canadian Aviation and Space Museum theatre. See Morgana’s blog post about the screening and the acceptance of GIFTS into NFFTY (National Film Festival for Talented Youth).